Well, this game did far from disappoint. High profile, two giants of teams and plenty of quality and skill throughout. It was a fun game to watch, each team with a more attacking than defensive mindset, which swung the game wide open for a lot of the 90 minutes. Croatia put in an amazing latter second half performance to cruise to a 3-0 win, picking up the three points and securing qualification into the knockout stages. As for Argentina, they need to beat Nigeria heavily, and hope that Nigeria beat Iceland before they do so, in order to have a chance of going through for sure. Jorge Sampaoli chopped and changed his playing style for this one, putting in three at the back to give a different dynamic to the play. 3-4-2-1 he went for in the end. 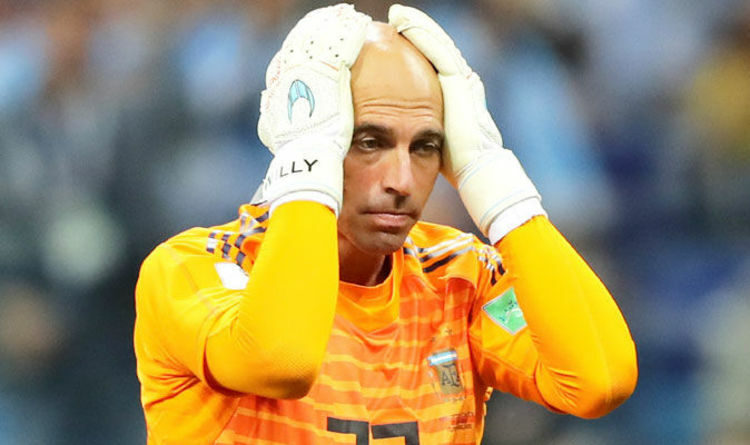 Caballero stayed in goal, but Rojo was demoted to the bench after exposing his frailties in the last game. Mercado, Otamendi and Tagliafico were the centre backs, with Salvio and Acuna playing in the wing back positions. Mascherano stayed in deep, with Enzo Perez now joining him instead of Biglia. Messi and Meza were right and left forwards respectively, Agüero playing down the middle. Zlatko Dalic and his boys came out in a 4-2-3-1 formation. Subasic was the goalie. In front of him were: Ivan Strinic, Domagoj Vida, Dejan Lovren and Sime Vrsaljlko (left to right). Rakitic and Brozovic took the helm in the CM positions, pushing captain Modric up to CAM. Perisic stayed at left mid, with Rebic on the right. The number 9 was Mario Mandzukic of Juventus. The game started well, both teams looking forward and playing with the 'attack is the best form of defence' mentality. This exposed the defences too much, and allowed both sets of forward players to run in at the defence. A long ball over the top fell to Meza, who turned a struggling Lovren and forced the ball off Vida. The ball went straight to Perez, who fired wide of an almost empty goal. Cue Mandzukic later in the same first half; a peach of a delivery from the right by Vrsaljko went to the six yard box. Mandzukic timed his run to perfection but could only glance his header wide of the left post. Big chances spurned by both sides. 0-0 at halftime. The second half was when things picked up, big time. In the 50th minute, following a backpass, Caballero has a howler and chips the ball straight in the air. Rebic locked his eyes on the ball as it came down, got his foot nice and high over the ball and laced a volley in over a mortified and hapless Caballero. Argentina looked to counter and try and get back in it, bringing Higuain, Pavon and then Dybala on to effect a change, but it was of no avail. Luka Modric, from the edge of the area, turned and curled a rocket into the bottom corner. Rakitic sealed the points with a side foot in the first minute of added time. A very good game for Croatia and a horrendous one for Argentina, I've never seen them play so poorly in my life. They were deflated, with no confidence and couldn't penetrate up top. They couldn't get the ball to Messi which is their strategy usually, indicating over-dependence and too much expectation of the captain. Without the ball, a world class forward is nothing, and without Messi the Argentine national team appear as such. Outplayed and outclassed by the European side. making passes and saves, commanded with little conviction and his league experience definitely did not show one bit. He made one good save off Rebic in the first half, did ok to keep it at 0-0. However, his second half mistake was utterly diabolical, one he'll want to forget so badly. He needs to learn how to parry the ball too, as after saving a shot well he then presented it for Rakitic to finish the move. Similarly with the Iceland game. I think his inexperience in the international format really shows, as you can't make those mistakes at a World Cup, whereas you might be able to recover in a league season. Eduardo Salvio (4.5) Was ok going forward and did whip the odd ball in, but he just didn't track back one bit. Areas in behind were exposed and his work rate was really low. Nicolas Tagliafico (5) Not a great performance from the young defender. Couldn't cope too well with the Croatian offence. Nicolas Otamendi (5) Was sloppy, tired easily and lost his rag at times. Wasn't in control. The three at the back didn't work for Jorge, and he may as well have kept Rojo in the team given this performance by the central defenders. Gabriel Mercado (6) Looked more potent passing and dribbling with the ball. Played with more intent. Wasn't great at the back though but that's the story fo the Argentine defence right now. Marcos Acuna (6.5) Looked lively down the flank, played some great passes and crosses. Tracked back ok but much like his wing back counterpart he left a lot of space in behind. Javier Mascherano (5.5) Not what we're used to seeing with this man. Wasn't on the ball quick enough and didn't want it as much. Played with a bit of creativity looking forward, though. Enzo Perez (5.5) A sad reintroduction into the team, with such a heavy loss. He really should be hitting the target with the huge chance he had in the first half, which would have changed the whole game. If Messi took responsibility of the loss due to his missed spot kick against Iceland, then some blame in this loss is down to Perez. Maximiliano Meza (6) Hardly affected the game, wasn't too poor off the ball. Worked well and got some shots away. Lionel Messi (5) A sad performance by the world's finest. Barely touched the ball, had no service, and struggled so much to try and start passages of play himself from deep midfield. A below par game from him. There's only so much one can carry a team. Sergio Agüero (5) Not his best game, and sums up the whole Argentina side. Little potency going forward. Gonzalo Higuain (5) Like for like switch, but had very little impact in off the bench. Cristian Pavon (5.5) Came on as an offensive switch for a more defensive player in Salvio. Forward thinking, but not effective at all. Paolo Dybala (6) Should've started the game really. Tried to make inroads and slot people through, coming in from the wing. Did alright for the quarter of an hour he was on. Danijel Subasic (7.5) If you get a second World Cup clean sheet in a row, against one of the best sides on the planet, you can only be pleased as a goalkeeper. Played very well, made his experience shine through and commanded the box and his defenders exceptionally. Got down low terrifically at 1-0 to keep out a shot from Meza, and maintain the scoreline. Sime Vrsaljko (8) Very good stuff from the right back. Attacked and defended splendidly, finding the right balance too. Was rugged in tackles and lethal with some of his crosses. Domagoj Vida (6.5) Quite unstable in the first half, sured up in the second half. It was his mistake that could've given Argentina the opener, and he wasn't too comfortable on the ball. Got better as the game progressed and overall had a par game. Dejan Lovren (7) Again, got better in the second half. Overall his game was good. Ivan Strinic (6) Quite average, but didn't set a foot too wrong in the game, that I can think of. Marcelo Brozovic (7.5) Sat in well along with Rakitic, and assisted a goal. The young player was determined and committed to the cause. Ivan Rakitic had a superb game in the middle of the park. scintillating stuff from the Barca man, I really enjoyed watching him play in this game. His passing was on point, he lunged into tackles everywhere and fought hard for the ball. His creativity was evident in the runs he made and plays he started, so much so that the Argentines were fouling him left right and centre. At 1-0, his last ditch, diving block proved vital in keeping out a Messi shot. To top it all off, he smacked the corner of the woodwork straight from a free kick and even scored a goal right at the end. A passionate, exemplary centre mid's performance. Ivan Perisic (7) Your everyday winger's performance, moving forward, using the midfielders and fullbacks to start attacks, and his shooting was persistent. Luka Modric (9) This was a performance that justifies his name tags, one of the best centre mids in the world. Played like a true captain, leading the team, allowing the players to gel. He made things happen, providing a creative and intelligent spark. His pass execution and vision in the game were just tip top. Tucked away a long range beauty too. Ante Rebic (8) A key player. Did exactly what was expected of him, but to such a good standard. Danced around the pitch, moving brilliantly on and off the ball. His goal was textbook stuff, and he kept his cool when he needed to. Shame he picked up a knock in the 57th minute, 4 minutes after his goal. Mario Mandzukic (6.5) Was quiet alone up there. Didn't get too much service, and when he did, he didn't make the most of it. Players of his calibre should be putting away pearlers like those from the right back all day long, he's lucky it didn't cost the team. Vedran Corluka (n/a) Came on in the 90+2 minute for his 100th international cap, yellow carded in the 90+4 minute. All that's there for me to say really! Mateo Kovacic (7) Came on with about ten minutes left, and provided an assist for Rakitic's goal in the 90+1 minute. Andrej Kramaric (7) Threatening as ever, a good swap for the injured Rebic. He played well.